Adey's big contribution to the aquarium community was in the separation of the nutrient generators from the nutrient consumers. The generators are the animals, micro creatures, and bacteria that all generate ammonia, whereas the consumers are the algae which consume this ammonia. On reefs this is all intermixed, and it keeps nutrients inside the reef, but he separated out the algae and created a device which mimics the environment where the most biomass of algae grew the fastest: where waves crash down on rocks. As soon as you scraped algae off of these rocks, it could be fully regrown in just 24 hours, and that's even while teams of herbivores were eating it. This could be a 100x increase in biomass in 24 hours, which absorbs a tremendous amount of nutrients from the water. 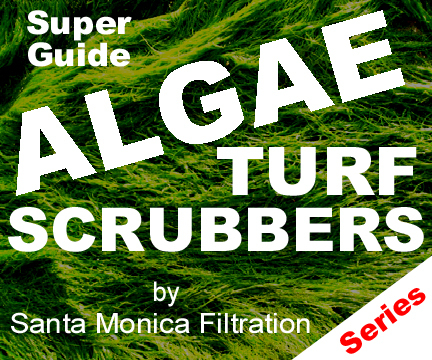 His device in 1980 used a dumping bucket to pour water onto a very shallow screen, and thus made a bubbling turbulent air/water interface that grew a lot of biomass of algae fast, and he called this device a "turf scrubber" because it grew a turf algae and it scrubbed (removed) nutrients from the water. By separating the nutrient producers from the nutrient consumers, the conditions for operation of the consumers can be controlled and optimized without changing the conditions for the rest of the reef (aquarium) itself. Adey licensed the design to someone to have some small models made, but nobody ever really sold many of these dumping bucket designs because they were so big, complex, splashy and noisy, and also they were just 1-sided (top side) only which grows less. Also, Adey never had any interest in making or selling them himself, so they disappeared. Later in the 1990's a few people made and sold the simple horizontal river design, like the Aquaricare scrubber which had little baffles to stir up the water and create a more turbulent air/water interface (the light on top is removed for the photo). But it too was large, splashy, hazardous (used high voltage T5 bulbs and wiring), and was also just 1-sided (top side) which meant it had to be larger to make up for less dense growth. And so, up until 2007 the basic algae scrubber designs were the dump bucket, horizontal river, and rotating wheel. And none were really being sold, so nobody knew about them. Then came "SantaMonica" (us!) on the forums in 2007, with the first waterfall style scrubber. The thinking was that there must be an easier way to get a turbulent air/water interface on a screen than using a bucket, a wheel, or a river. Let gravity do the work straight down! And a waterfall on a screen could have lights and growth on both sides, so it would grow more and could be half the size. This first waterfall was put into a bucket on a sink in the office, complete with dangerous CFL bulbs that got shorted by salt spray. This was all posted on various forums as "Waterfall Turf Algea Filter: CHEAP and EASY to build" if you want to read it. It grew great, and brought nutrients down to zero with no water changes. But in order to get a waterfall in to our sump area it would have to be low-profile, so a custom acrylic box was made and the SantaMonica100 was born (100 was for 100 gallons).. This was the first model to sell any real amounts. But it had flaws which caused it to be left behind in favor of our modern versions. First, it could not reliably be mounted anywhere but over a sump, because a clogged drain would cause an overflow onto the floor, or a clogged slot would cause water shooting out the top, even with a lid. Second, the cleaning/harvesting process was very involved, requiring water shutoff and disassembly of some plumbing or even taking the whole scrubber out. Third, the acrylic was fragile and easily cracked, especially after many heating/cooling cycles. And lastly, the high voltage 240/120 volt metal-case lights were dangerous for non-DIY users who just wanted a safe product. The lights would slowly corrode in the salty environment, and eventually short out. 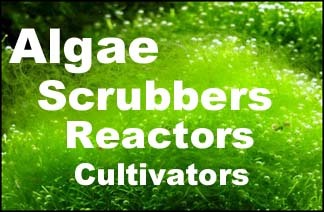 And so there you have it; the evolution of the algae turf scrubber from the 1970's to today. We'll get into many other topics, but for now will just link to one of our smaller modern models, the HOG1, which is a great "starter" scrubber.